Conte Rasponi, Florence and Milan, and thence by descent to the present owner. Letter from René Magritte to Gasparo del Corso, 6 November 1952. Letter from René Magritte to Gasparo del Corso, 11 December 1952. Giovedì, Rome, 29 January 1953 (illustrated). D. Sylvester, ed., René Magritte, Catalogue raisonné, vol. IV, Gouaches, Temperas, Watercolours and Papiers Collés 1918-1967, Antwerp, 1994, vol. IV, no. 1335 (illustrated p. 144). Rome, Galleria dell'Obelisco, Magritte, January - February 1953, no. 21. Sold with a photocertificate by the Comité Magritte. Floating through the urban environment, past a vast modern building, is a hot-air balloon, doubtless peopled by intrepid explorers. They could be straight out of a Jules Verne story, and yet are seen here passing a building that appears reminiscent of cities such as like New York. Are they off course? Are they an anachronism? Or have they ventured far to search the alien avenues of the modern metropolis? 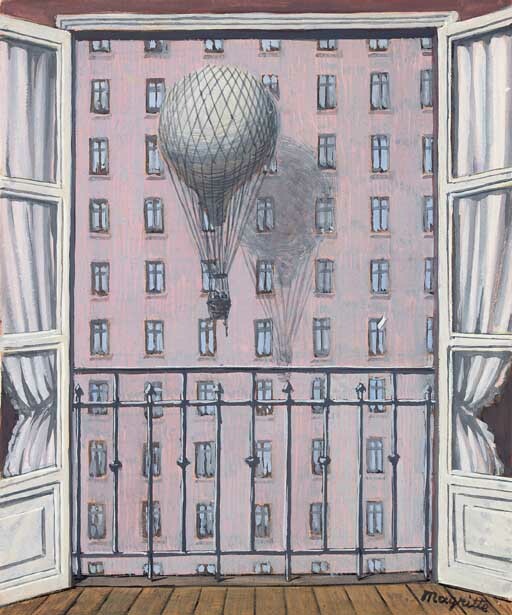 Executed in 1952, L'amateur de coquillages combines and contrasts two distinct ages of technology, sending the vintage-looking balloon past a wall that appears, through the frame of the window in the foreground, endless, as though it were part of some inconceivably large skyscraper. This is a contrast not only between past and present; it is also a contrast between control and chance, with the rigid structure of the building a foil to the whichever-way-the-wind-blows nature of ballooning. And crucially, L'amateur de coquillages explores the contrast between the city and the wilderness. The balloon is clearly out of place here, outmoded, redundant, and should instead be floating over great plains, exploring, viewing from above. Here, though, it is dwarfed by man-made edifices. The theme of the balloon featured in several of Magritte's works. On the one hand, it introduces a sense of lightness, while on the other, it also insists on the viewer contemplating a new perspective. For the travellers in the balloon see the world from above as they wend their way along. And it is the search of a new perspective that is so crucial to Magritte's deeply lyrical Surrealism. In L'amateur de coquillages, he asks us to look again at the cities of our world, and to consider the wildness that they so barely conceal. The order and human endeavour that results in the growth of the metropolis is itself a strange force, and Magritte begs us to view it as such, to look at it with both the cool distance of a naturalist and the wide-eyed awe of a visionary. He is encouraging us to view the everyday world around us, to which we have all grown too accustomed, as though we too were explorers.